At many sit-in sites, the women protesters brought sewing machines and black cloth with them to prepare ribbons, arm bands and scarves. CHANDIGARH: As Jats are observing 'Black Day' in Haryana today, tight security is in place and traffic has been diverted at some areas in sensitive districts. 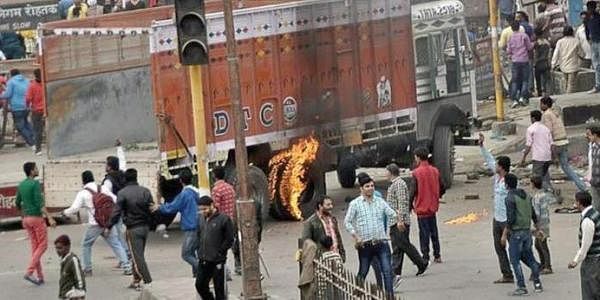 The Jats, who have been carrying out an agitation in the state for reservation for nearly a month, began gathering in large numbers at many places including Rohtak, Sonepat, Jhajjar and Bhiwani districts. The police have set up 'nakas' to divert traffic on the NH 71-A suggesting alternative routes to travel between Rohtak and Panipat, officials said. 'Nakas' have also been set up on all roads leading to Rohtak town to prevent the entry of protesters and they have been asked to use the outer bypass of the town to reach the sit-in sites. Paramilitary forces are also keeping a vigil at many places, officials said. The community members wore black attire, turbans, caps, ribbons and arm bands to protest against the state government not accepting their demands, including reservation and withdrawal of cases against the protesters in connection with the last year's quota agitation. At many sit-in sites, the women protesters brought sewing machines and black cloth with them to prepare ribbons, arm bands and scarves. The current stir is being spearheaded by All-India Jat Aarakshan Sangharsh Samiti (AIJASS). Adequate police force has been deployed at vulnerable points to ensure that normal life was not disrupted and all essential services continue uninterrupted in the state, officials said. Internet services had been suspended at some sensitive places including Rohtak and Sonipat. To maintain law and order, Sonipat District Magistrate K Makarand Pandurang had issued orders to impose ban on all internet services under Section 144 of the Criminal Procedure Code for 24 hours with effect from 5 pm yesterday till 5 pm today. The District Magistrate said the ban had been imposed to prevent people from misusing these services to spread wrong information and rumours. Besides seeking quota in education and government jobs under Other Backward Classes category, the demands of the Jats include release of those jailed during last year's agitation, withdrawal of cases slapped during the protest and government jobs for the kin of those killed and injured while taking part in the stir.